Flottman Company has launched their new website emphasizing Brilliant Communications via their areas of service expertise – Marketing, Folding and Printing. 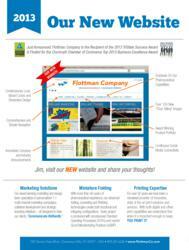 Flottman Company has unveiled their new corporate website. The completely redesigned site, http://www.FlottmanCo.com, provides 24/7 online access to a vast array of B2B and B2C strategic marketing, folding and print communication services. The website now offers visitors a more contemporary look with vibrant colors, simple navigation and an overall streamline design. The site contains more than 100 “Story-Telling” images that serve as portals to access essential information. The user-friendly interface makes it simple for visitors to see what Flottman Company can do and serves to empower customers to consider new concepts for success. The new website is designed to be comprehensive and informative. There is a strong emphasis on the company’s pharmaceutical capabilities with over 40-years of folding experience. The site also details Flottman’s strategic and multi-channel marketing abilities and highlights over 90-years of printing expertise. The Award Winning Product Portfolio presents pictures, descriptions and results to demonstrate the Flottman Company’s partner successes. Social media will play a vital role in maintaining website content with Flottman’s Facebook page being streamed live. For the first time the Flottman website will also provide immediate industry and company news directly on the home page. “Our website is the first opportunity we have to impress a client or potential client and we wanted to make it easy to access the right information at the right time and present it in a visually appealing manner. We wanted to practice what we preach; Brilliant Communications,” stated Tom Flottman, CEO - Flottman Company. The Flottman Company is a family owned, full-service, communications provider renowned for delivering high quality, result driven marketing solutions. Specializing in target marketing, design, printing, miniature folding and multi-channel media strategies, the Flottman Company empowers companies to Communicate Brilliantly.